This campsite sits in a tranquil area overlooking the Gulf of St. Lawrence in Quebec, Canada at the Sebka Campground. The clouds close in around the pastel colored sky at sunset and what the evening weather brings for this campsite is yet to be seen. 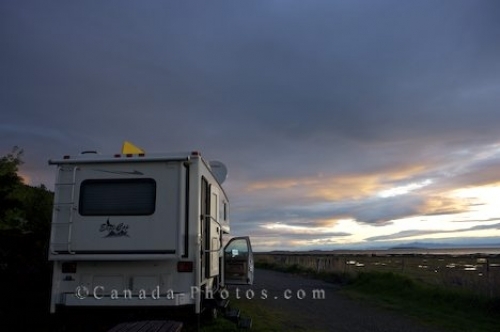 Picture of a camper situated at a campsite at the Sebka Campground along the Gulf of St. Lawrence in Kamouraska, Quebec.